Old Marion District/County South Carolina contained the present day counties of Marion and Dillon and the eastern half of what is now Florence County. There were many Campbell families living there in the 1800's and 1900's. Many are related, but there do seem to be several "sets" of them who were not connected to the others. I've attempted to document them all, white and black. I've traced most lines as far back as I could, and as recent as the early 1900's when possible, and some lines to the present day. Chapter 1 - Are they all related? 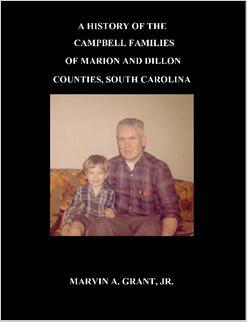 Chapter 15 - African American Campbell Families (Marion, Dillon and Florence). Appendix A - Census Records 1790-1900. All the Campbells in the area on the 1790 through 1900 census. Appendix B - Campbell Soldiers - Campbells who served in the War of 1812 and the Civil War. Index - Full name index, including maiden names when known. Edition: Second (24 Nov 2004); originally published April 2004. If you wish to pay by check or money order you must order it from me via snail-mail. Send $33.50 to me at: Marty Grant, 3291 Alton Phillips Road, Kinston, NC 28504. The price for snail-mail orders includes shipping and handling. Once your check has cleared I will order the book for you and have it shipped to your address.